Give user everything for free. Give them everything they do offline a way to do it online. If I do not have a service find some who does and include it in the google service roster. If I am missing content let the users create it for me. Google's approach is very different that the IT giants of the past and many of the IT giants of the present. Users appreciate that, while on the other hand the rest of the big players find a hard time to compete. I do not know, it may be their board of directors that find it hard to swallow to give everything for free. As everybody knows, Google's approach has worked beyond anybody would have imagined some years ago. They have managed to be in less than 10 years one of the, if not the, biggest player in IT. Someone would just might accuse Google of doing everything for the advertising namely adsense/adwords and this just might be true. Some even say that the new android mobile platform is just a Trojan horse to sell more advertisement places through whole new marketing medium: the mobile phone. Blogger is an excellent tool for everybody to speak their minds. In addition it is also a very effective way for Google to dramatically increase the advertisement space, with all those blogs that were created and use adsense. The truth though, is that the consumer (this is us) has benefited from this. At the end of the day, it all just might be a way to create everything for your digital life in order to be the sole player on online advertisements. I do not know if I would mind that and I certainly wont go into that now, but I definitely enjoy all the cool free services. 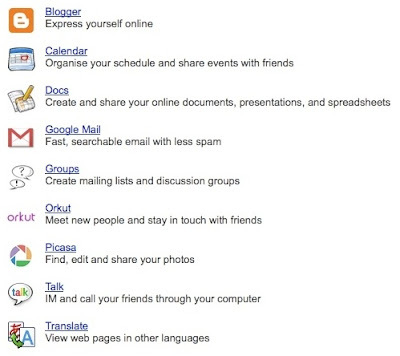 They continually improve everything from iGoogle, to Gmail, to Google Documents. That practice is appreciated by the end user that is seeing the quality of his digital life to be improved. I enjoy the added productivity of being able to share documents with my colleagues through Google Documents, I enjoy directing all my email accounts to one gmail account and host them there forever, I very much like the ability to use Google web toolkit to write rich ajax applications without having to worry about spaghetti code and Browser incompatibilities and so many other countless things. The truth also is that Google helped in essence to get the world away from the dotcom era disaster of the late 90s/early 00s that plummet the entire Internet. This was mainly because of Google's advertising service that refreshed a dead industry of and set the standards for online advertisement. At the end of the day I hope that more companies follow the Google approach . As a user and a consumer I would choose free, high quality, open services any day of the week to closed, proprietary, commercial services. Wouldn't you? I agree I use Google more and more and I am also more and more open source and getting away from the very expensive in the box crap one has to deal with.